One order of Sven Can See® Anti-Fog/Anti-Frost Extreme Cold Spray Gel includes (one) 0.338oz / 10mL pen-like spray applicator and comes with a 100% money back guarantee. Operating in temperatures HIGHER than 20°F? Try our Sven Can See® Anti-Fog Spray Gel instead! It prevents fog from developing on your eyewear in cold to high heat situations! *We recommend using our Sven Can See® Lens Cleaner in conjunction with Anti-Fog/Anti-Frost Extreme Cold Spray Gel, however it is not required in order to have great success with this product. Lightly spray Anti-Frost Gel onto lens surface (just one drop will do!). Wait 10 minutes and allow the product to set. 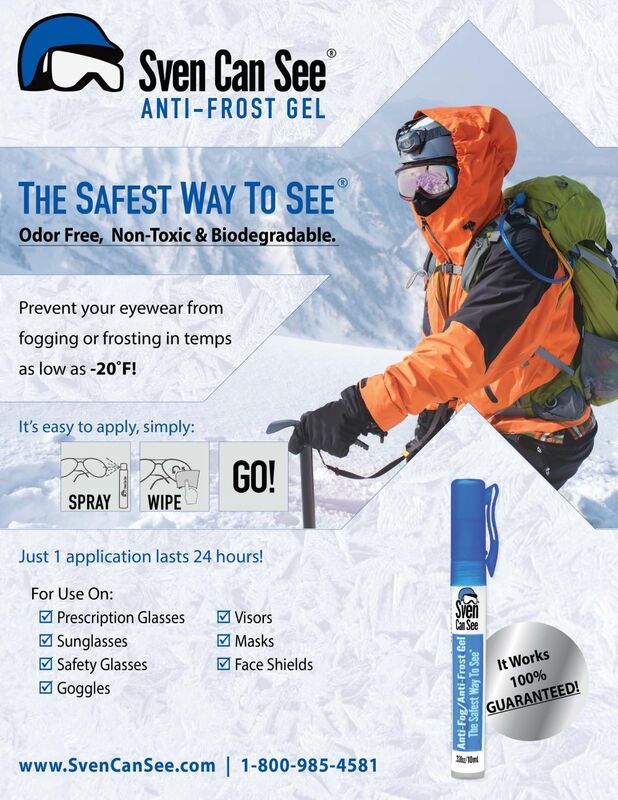 Brave the elements with fog and frost free vision from The Safest Way to See®! Great results used on hockey visor! This is by far the best anti-fog spray that I have ever used. I have gone through the frustrations of using every over the counter sprays that have been sold at hockey stores. No other anti-fog spray that I have experienced with in my thirty years of playing hockey has come close to this product. Very happy with the positive results and I will continue to use this outstanding product you have produced. Thank you! Had a similar issue with vision that wasn't very clear on 2nd and 3rd applications. But then I cleaned off the lens of my swim goggles and reapplied. Worked great. Works great on sunglasses outside in winter's cold too. I've had the opportunity to use the spray a few times this winter on my goggles while doing ski patrol work in Utah. In sweaty/fogging conditions and in freezing conditions my lenses have stayed clear. Take the time to apply and buff correctly .